Enterasys, part of Extreme Networks, has been a leading switching manufacturer at the forefront of the market for decades. Its solutions range from enterprise-class access (SMBs and large enterprises) to modular end-to-end terabit switches for data centers, high-performance stacking, industrial environments (PoE+, high-power CCTV devices, WLAN access points), servers and storage devices, PoE to power wireless APs, and IP phones. Enables flexible management via industry-standard ExtremeCLoud, ExtremeManagement, web client and Command Line Interface (CLI). In addition to switches, it offers equipment such as Fast Ethernet port amplifiers, Half-Duplex to Full-Duplex converters, etc. 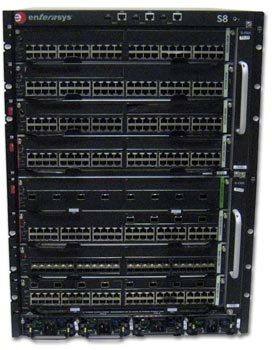 ZOOstock has a wide range of new and used Enterasys switches and routers, refurbished (tested and of the highest reliability) and end of life models.